Tonight we are camped at the incredible spot in the photos overlooking 'Preda das Portas' - a huge dam at high altitude in Galicia. It's a very silent, peaceful spot with only the very occasional passing truck. Rio, Rab and I have been sitting in the sun all afternoon. We decided to postpone the afternoon leg planned for today when we ended up here. The rational for this trip has been to avoid motorways where possible, and to take detours into national parks or backcountry areas when we are passing through an interesting region. That way places like this are to be found. Yesterday's journey (stage 5) took us from Ponferrada, where my last entry ended, to A Ruá along more winding hilly roads into Galicia. We followed a route through old rural Spain on some very narrow roads, passing through old country mansion gateways and down into vineyards. Some narrow overhanging first storeys would have been impassable in a larger camper. 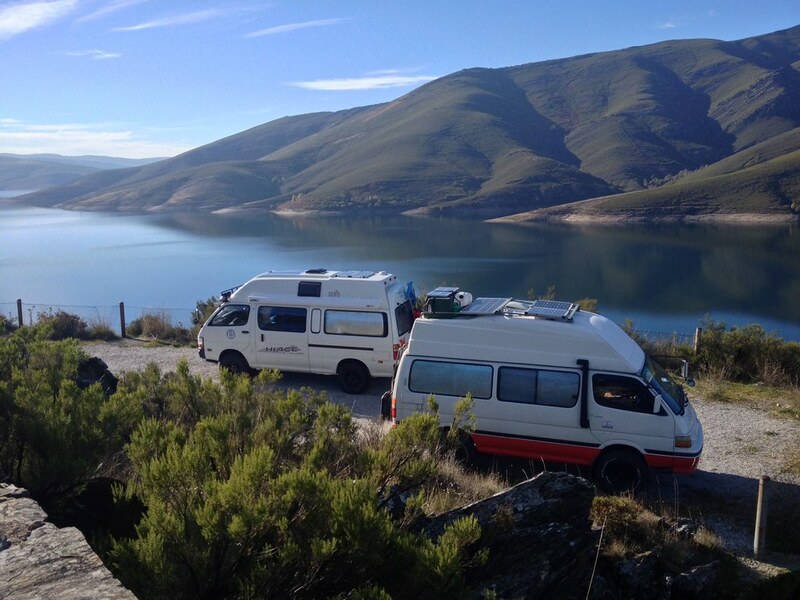 With a few wrong turns and some manoeuvring we made it through to A Ruá where we spent the night by a lake. Fish jumped in the moonlight, and a church glistened in lights on a hill above after dark. After picking up some groceries in the town this morning we set off again for stage 6, the first part of today's route taking the detour off the OU-533 that led us here. This is an area of reservoirs and along the route we crossed some spectacular old viaducts, seemingly higher still due to the low water level at the minute. Many tree stumps were visible on the exposed bed far below. A very varied journey and something new and interesting around every corner or over every hill. Tomorrow onwards across the frontier into northern Portugal.. It'd be nice to hear from anyone out there who's enjoying the site. Glad to see your rolling again. Some amazing scenery there! Keep the post coming and maybe a video or two?